A version of Hexagram Lacing using U-Lace no-tie laces instead of regular shoelaces. Forms a hexagram, or six pointed star. 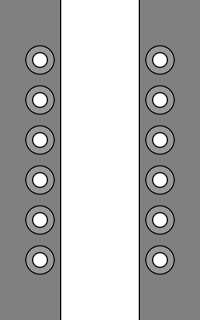 • Use a single U-Lace segment to lace straight across the bottom row of eyelets. • Use two U-Lace segments to lace a tall "X" from eyelet row 2 to row 5 (skip past two rows). One segment runs up and right, the other runs up and left. • Use a single U-Lace segment to lace straight across eyelet row 4, passing over the left diagonal and under the right diagonal. • Use another U-Lace segment to lace straight across eyelet row 5. • Use two U-Lace segments to lace a second tall "X" from eyelet row 4 to row 7 (skip past two rows), carefully observing the overpasses and underpasses to form a consistent pattern. • Use single U-Lace segments to lace straight across any remaining rows of eyelets to the top of the shoe. • Use two U-Lace segments to lace a tall "X" from eyelet row 1 to row 4 (skip past two rows). One segment runs up and right, the other runs up and left. • Use a single U-Lace segment to lace straight across eyelet row 3, passing over the left diagonal and under the right diagonal. 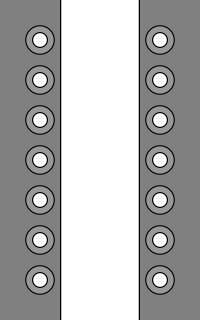 • Use another U-Lace segment to lace straight across eyelet row 4. • Use two U-Lace segments to lace a second tall "X" from eyelet row 3 to row 6 (skip past two rows), carefully observing the overpasses and underpasses to form a consistent pattern. 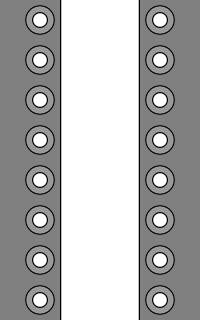 • Use a final U-Lace segment to lace straight across the top row of eyelets. • If the crossovers of the laces are carefully woven as shown, there will be a couple of benefits. Firstly, it accurately depicts the rotational symmetry of the traditional "Star of David". Secondly, each point of the Hexagram has the same number of overpasses and underpasses, which helps to maintain the shape more securely. • Depending on the eyelet spacing, skipping the middle row of eyelets may create a taller hexagram of more pleasing proportions. • Use the same U-Lace color throughout to replicate the look of a regular, single shoelace. • Alternate two different U-Lace colors for a bi-color look. • Use several different U-Lace colors for a rainbow or multi-colored look. Converse Chuck Taylor All Star Syde Street Leather Mids with U-Lace Hexagram Lacing. Contribute a photo of this lacing method and have your picture appear on this page as well as on the Shoe Lacing Photos page. Identical lacing method for regular shoelaces. This page last updated: 15-Oct-2018. Copyright © 2018 by Ian W. Fieggen. All rights reserved.